Once upon a time, the roll call of presidents within the Hall of Presidents did not conclude with an address from the current Commander in Chief. When the attraction was revamped and refreshed in 1993, a new narration was recorded by Maya Angelou. More importantly, the sitting chief executive, President Bill Clinton, became the first president to record a short speech that would be included within the Hall of Presidents presentation. 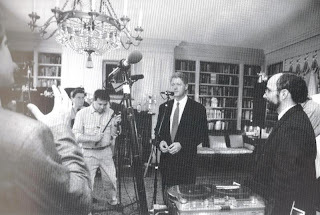 After overcoming the impediments of approaching and gaining the interest of President Clinton’s staff, piquing the president’s interest, and recognizing that the recording would be happening on the schedule of world events and not the Imagineers’ timetable, a tentative date was set to record the session in September of 1993. Walt Disney Imagineering sent a team of five to Washington, D.C., where other obstacles reared their heads, from schedule shifting, to room acoustics and assignments and even last minute changes to language in the scripted speech. 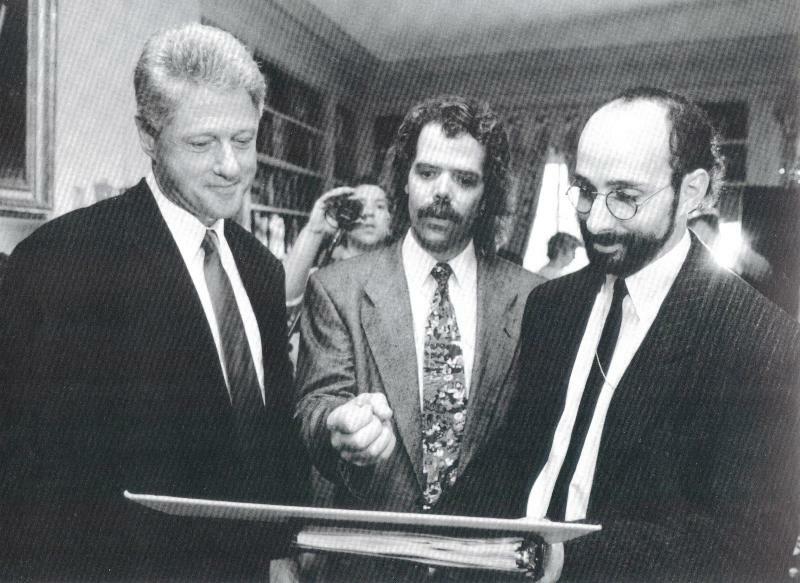 The team, which included Rich Rothschild, H.F. Crane, Brian Jolley, Greg Krueger and Justin Segal, toured through several rooms of The White House on 2 September 1993, where the meaning of a living museum took hold. Starting with The Roosevelt Room (featuring artifacts from the lives of both Franklin and Theodore Roosevelt), the team moved from the original slotted space to the Diplomatic Reception Room (home to Franklin Roosevelt’s fireside chats), then to the Red Room, before settling in, and hoping for the availability of, the Library. Filled with presidential gifts, including those brought from WDI, and volumes bound with the words of Twain, Thoreau, and Cooper, the Library would be where President Clinton would record his address. Glitches would continue to ensue on recording day, 3 September 1993, but all would be overcome by the time the president arrived to record his speech. The final, Clintonized oration would be recorded with a time a hair under one minute and fifteen seconds, perfectly aligning itself with the previously laid down audio track. The recording would require two takes, based upon President Bill Clinton’s request, with body movements and language being recorded during the first take. The nerve-wracking plotting and planning culminated in a whirlwind recording session that no one on the Walt Disney Imagineering band would forget. The Hall of Presidents would reopen on 18 November 1993, with the latest Audio-Animatronics presidential figure and the first recording of the sitting chief executive. When President Bill Clinton took to the attraction’s stage he did so not only with the title of Commander in Chief, but also Honorary Imagineer. I thought the Bill Clinton version opened in October 1993?